Please realize that color research is ongoing in different fronts. The ADMS is conducting research as supervised by Dr. Phillip Sponenberg, DVM PhD and with the new Donkey Color Genome Project with Dr Michal Prochazka of Pet DNA of AZ. Our work is not complete, but there are some aspects which have already been proven. If we can't answer one of your questions now, please feel free to contact us at the office and discuss it with us. Defining the various colors - these will be based on the ADMS color definition sheet. What are some of the distinguishing marks of the various colors, ie eyelashes, hoof color etc. The areas that should be looked at first in distinguishing the colors are first the body, for the base color. Then the color of the mane, tail and cross (the trim) should be noted as modifications of the body color. Lastly, the color of the lower legs is important. The lower legs might be covered up by the frosty pattern, in which we have to do a closer examination of different areas of the legs and also the trim to determine color. This is why we use the different descriptions on the registration certificates. We use the trim color and the lower leg color to help give a more complete color overview. A red body with black trim and roan legs is listed as russet, because the roan on the legs covers up where you might normally see black. A red body with red trim and roan legs is sorrel (and probably frosty roan). A red body with red trim and dark red or brown lower legs is sorrel or the red dun pattern. All three have a red body. Two have dark red trim. The combination of all of the parts has to be used, not just one main area. How do you identify colors for registrations? Again, we are referring back to the ADMS color guide. We must rely on both the breeder's observations, and also the color photographs we are sent. Unfortunately, it's hard to get photos with good color. However, foal coat color is the absolute worst indicator of adult color. We have records of donkeys that were pink in winter coats, but just as dark a gray-dun in their shed summer coat as you have ever seen. Genetically, the animal was gray-dun. It may be that all Gray- duns have some degree of red in the coat. Black certainly bleaches out to red in the sun, and many brown foals have a gorgeous "redhead" foal coat that they lose as they mature. Actually, the notion of having one color in a baby coat that is lost at maturity is not at all farfetched. Zebra foals have red stripes at birth that darken to black. Lion cubs are born with immature rosette markings that fade out in the adult animal. 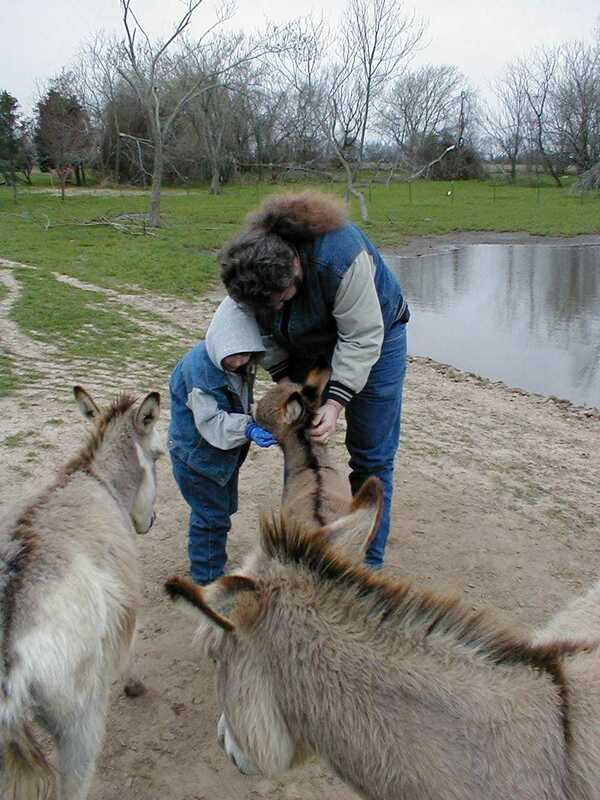 The red color in donkey coats may be of a similar nature. 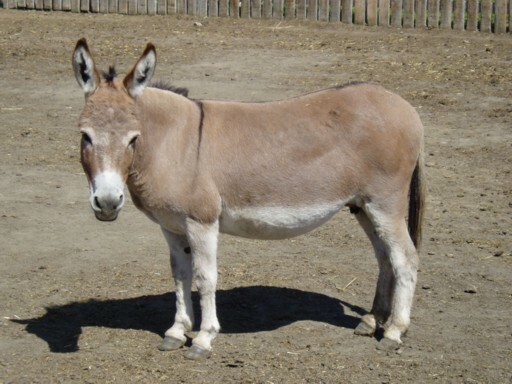 Donkeys are probably less removed from their primitive roots as wild asses than are horses, so the red color may be a "wild" protective coloration leftover. Should one breed for color? Conformation, and temperament should always be the first concern of a breeder. Size is of concern only when you are trying to make sure your animals fall within a LIMIT (use donkeys under 34 inches if you want 30-33" donkeys, or make sure that the difference in height is not TOO great between the two parents (such as using s 34" jack on a 28" jennet) but color should always be considered a bonus. Use the best jennets and especially the best jacks you can find of the particular colors you are striving for. For the betterment of the breed as a whole, it is better to use a 36" gray-dun jack with perfect conformation than the brightest of sorrels that is 30" tall but has dwarf characteristics or is roach backed and bow-legged. How do you determine which cross will produce what color? First, you must look at the visual color. Although some coat colors can fool you, most are a pretty good indicator of what dominant genes you are dealing with. To be able to project what combinations you would get from a pair, you would need to know their genetic makeup. You can tell some of this by looking at the pedigree or background. But the best way is to see what other colors those animals have produced. There is no absolute way to be able to look at an animal with no background, or one that is untried, and be certain what colors it will throw, even if is one of the darker colors, which are usually recessive. Too many factors may be masked or covered up. We have dark brown animals with recessive sorrel, and ?black/browns? that seem are probably genetically black-based with the brown agouti modifier. You can narrow your chances down somewhat, but 100% certainty is difficult. There are basically two types of genes - dominant and recessive. Dominant are the strongest. They win - they get expressed. Recessive are "weaker". They keep their head down and hide. They can hide for many generations. In order for a recessive gene to be expressed, it has to team up with a partner from the other side (the other parent). Once the recessive finds his "twin" on the other side, Recessive is now stronger than dominant and wins out. The color expressed is the recessive, and the dominant color gene gets left out entirely, gone from the picture, just a memory. We can use gray-dun and red (sorrel) as an example. The jack is gray-dun but he has a recessive sorrel gene - let's say his mom was sorrel. (He has one dominant gene for black and one recessive for red, which would be Eeaa Dd). You breed him to ONLY gray-dun jennies. If these jennies have no sorrel gene (for this excercise they are EEDd and not any other combination), you will only get gray-dun (dominant color from the jennies, or even from the jack). But, if some of these jennies also have the recessive sorrel, you have a chance of it pairing up with the jack's sorrel gene. If this happens, and you get a sorrel colt, that colt will ONLY have the recessive sorrel gene to pass along (Sorrel/sorrel). The gray in his case is out of the picture. The same with spotted. Once the recessive Non-spotted animal jumps out, it won't matter how many spotted parents there were in the background. The dominant is lost and is not recoverable. Dominant colors can be homozygous (meaning the same, or one identical gene from each parent). This means that every foal from that parent will have at least one Dominant gene. If that foal has a recessive gene, it's not from the homozygous dominant parent. Gray-dun can be dominant. If a jennet is homozygous for gray-dun (slate/slate) , ALL of her foals will be gray-dun no matter what she is bred to. Dominants may also be heterozygous, meaning different, or mis-matched pairing of the genes (like that slate/sorrel jack above). Each of these foals has, theoretically, a 50/50 chance of getting either the dominant or the recessive gene. Recessives that are paired with a heterozygous dominant are passive. They are not expressed, but can be passed along. True paired recessives are the "surprise" colors that pop out of nowhere (like two gray-duns having a bright red sorrel foal). The animal is then homozygous for sorrel, it can only give a copy of the sorrel gene to it's offspring. How easy is it to get color? Well, in a sense, every animal has color. "Color" means something different to everyone. There are breeders who LIKE gray-duns - getting a good gray-dun foal to them IS getting color. If we are asking how easy it is to breed for a dominant color - it's a roulette game. If that dominant color has an underlying recessive, you have that chance of it pairing with a matching recessive from the other parent, and then you get a surprise. If you are trying to get recessive colors, the only sure-fire way is to breed ONLY like color to like color. Sorrel is recessive and can only contribute sorrel. So breed ONLY sorrel to sorrel and you will come up with sorrels. Once we get past the point where many animals of confusing tones were inadvertently labeled as sorrel, (where their records have proved them to be brown or rose dun, etc) and these are NOT used in red breeding programs any longer, then you will eventually have true sorrel bred to true sorrel, and you will have tons of little red donkeys everywhere. You breed a gray-dun to a sorrel and get a gray-dun foal that has a recessive sorrel gene (it has to, the sorrel parent can only give sorrel). You take this number-one foal (F1) and breed it to another sorrel (again, remember you only have sorrel genes coming from that sorrel). The foal of F1 (black + dun/sorrel x sorrel/sorrel) the chance of being the dominant color, the gray-dun, possible black if the dun was Dd, or the recessives, sorrel. It's a dice game, and dice don't always roll the way you want. By chance, you get the sorrel (F2) you wanted. Again, you take this sorrel (F2) to a sorrel and get sorrel (F3) , and so on, ad infinim. If you never bred any of the gray-duns into the herd again, you would only ever get sorrel forever (okay, you could have a mutated gene, but that's another research project). Please explain how to get spotted donkeys. The Spotted gene so far has proven to be a Partial or Incomplete Dominant, more properly termed heterozygous (meaning different, homo meaning the same). This means it takes only one dose of Spot to get the spots. It also means one parent must be spotted to have spotted offspring. This can be mostly-white with dark spots, or masked spotting. We have not yet found any animal that is for certain Homozygous (two doses) for spotting. Although donkey color doesn't act the same as horse color, we need to look at one horse example to clarify. In the Paint horse industry, owners with tobiano horses have found that their horses can be homozygous for tobiano. Tobiano is dominant. If their stallion is homozygous for tobiano, ALL of his foals will be tobiano marked, no matter what the color of the dam is. 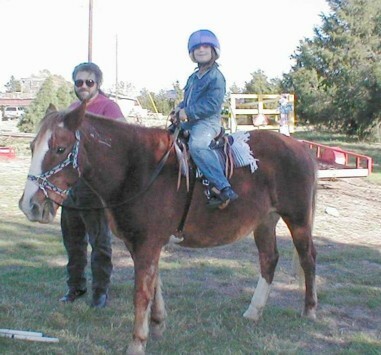 (And yes, even if the mare was solid or appaloosa. There are such things as pintaloosas). The paint horse breeders are now marking in their stud advertisements if their horses are Tt or TT markered. This way, if a breeder wants to make sure his sorrel QH mare has a paint foal, he goes to a TT stallion. Now look at it this way. That foal will be tobiano, but since the mother had no matching tobiano gene, the foal will be heterozygous (Tt). All of it's foals will have one chance to be spotted, and one not. That's the way it works in our spotted donkeys. Even using a spotted jack on spotted jennies sometimes results in the foal getting the short end of the "t" from both parents and coming out solid. You can't choose which gene they'll get, unfortunately, although we all wish we could. Take your best spotted jacks and put them to good jennies and you get a 50/50 chance of a spotted foal. Is there such a thing as a jack or jennet that is a consistent color producer? This is really an interesting subject. You have a spotted jack that manages to throw 75% spotted foals instead of the projected 50/50. That's a color producer. Why? Are the odds just good? Or is his spotted gene just "faster and stronger? And gets used more often? We don't know If you are getting a dark jack throwing dark foals, it's because the gray-dun jennies he might have been bred to were heterozygous (carrying only one copy of) the Dun gene. Sorrel jacks can't give anything else, it's up to the genetic background of the jenny (is she gray-dun with a recessive sorrel, recessive brown, or straight gray-dun across the board?). She has the key when you are dealing with a recessive gene, and is of course an important half if the jack has dominant genes to work with..
What colors were the original imports, and are "pure" colors, not bred-in colors? 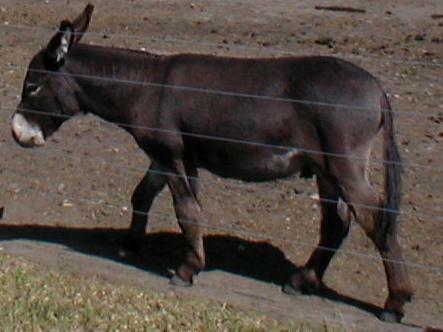 The original Sicilian, Sardinian, and Ethiopian Miniature sized donkeys that were imported to be the original gene pool were visually gray-dun and brown. They had both the familiar light points and the dark muzzles. We now know that Luigi 95, a prominent jack in many pedigrees, was the source of red (sorrel, russet, red dun, etc). in most of our pedigreed donkey population. There were obviously other donkeys with the recessive red as well. Brown is a dominant (At agouti form) and it's easy to see that the black, modified by Agouti came in the original imports. If you are asking if spotted is an "original" color or bred into the current population, there are two answers, Neither can really be proven so far. No spotted animals are recorded in the original registry records, BUT white blazes are often overlooked in donkeys! (Blue-eyed white is also a recessive, and can lie hidden, as can any recessive, for many generations. There is no reason to believe it was not carried in by one of the original donkeys. They were closely inbred for several generations, and inbreeding is one way to see the recessives start cropping up.) Also, there is some scientific proof that if you close-breed animals for enough generations, a mutation will crop up. Spotted hedgehogs, and spotted pot-bellied pigs are just two examples of inbreeding causing the partial-white mutation. The Przewaslki horse, the last true "wild" horse now has such a small gene pool they are being very closely inbred. There are reports of animals with white stars, white faces, and even white body spots beginning to show up. So are spots bred in from standard donkeys, or did we really have some minis with an undetected spot pattern? We don't know. What crosses produces black, spots, and sorrels. We really have to go into visual charts here. We are dealing with one type that is a straight recessives and two that is partial dominants. ADMS has a color packet with charts that can help you learn to see exactly how plotting works. Is there a deep red sorrel? There is a deep red in donkeys, but it is not the rich, blood-toned red in a horse. Donkey red is different, and always seems to hedge toward the brown or mousey tones. The red tone is also much clearer in the larger donkeys than in the miniatures. What is the foal coat color of gray-dun, black, spots and sorrels, and can foal coat determine color? Dr. Phil Sponenberg states that foal coat colors are the worst indicator of color. Foal coats can fool you. Go to our Mule Guru page and check out "Changing" coats. Have you ever heard of leopard appaloosa horses that are born dark, then turn into leopard spotted? Guess what!!! That's foal coat and that "protective coloration syndrome" we discussed earlier. Foal coats and winter coats are fine as descriptions for what the animal looks like at that stage. The freshly shed adult summer coat should be used as the true coat color. Freshly shed, because the sun can bleach colors. Even with the summer coat, we have some donkey colors that just won't be defined one way or the other. We have smoky blacks (because you CAN see a cross) and brown/gray-duns, because they show both mixed together. We can do breeding trials to see what colors they throw when they are adult. To answer the question -gray-dun foals may have dark charcoal coats, slate coats, brown coats, brown/tan, rose, or pink hair. Black foals usually have dark hair, black, although black Mammoth foals usually have red winter coats their first year. Spotted foals will keep the spotted pattern the same as the when they were born - the spotting doesn;t change, but the base color (the dark hair) will act the same as if the spotting wasn?t there - the gray-dun-and white spotted foal could the foal coat in the spotted areas any of the color we just mentioned (such as dark gray-dun, brown, rose, etc). If the animal is a frosted spotted white, the colors may be dark and will lighten up. The frosted spotted white foals you can sometimes tell when they are born because even though they have spots, they already have lost the color around the eyepatches, with only dark "mascara" showing. Other frosted foals are born with the dark patches already gone. (We are researching to see if there is some other factor that makes them fade faster - we'll publish when we know). Why are black and white spots so rare? We'll dealing with a two-strikes against situation. Black is dominant, but is diluted by Dun, and modified by Agouti This means both parents have to carry black or be black. Then you have to get the spots, which, as discussed earlier, you are getting 50/50 chances. If black spotted animals are only bred to gray-dun, then you have taken away the necessary factor to match up the black. If you want to try for black-and white spotted (or dark brown) you have to take your black and white spotted (say a jack) and breed him to a select group of jennies. This is your grouping: Group 1: all black jennies (in which you have a 50/50 chance of getting black solid or black spotted). Group 2, black and white spotted (you have a 50/50 chance for each of the parents to give a spotted gene) and all of your foals should be dark. Group 3 - the jennies should be gray-dun with one black parent. They should be carrying a recessive for dark (we'd rather say dark than black, or black/brown, or smoky, because of all the other factors on top that might cause black to come out looking brown, etc). If you take these black-carrier jennets and breed to your black spotted jack, you have the chance of gray-dun (since it's dominant) in both solid or spotted, and black if the genes pair up properly (in both solid and spotted, that 50/50 chance). The same thing applies to your gray-dun spotted jennets - if they have a black parent, you've got those chances for gray-dun or black, spotted or solid. You just have to hope that the genes pair up right and you manage to get the dark spots. Are there any health problems inherent in various colors? We need to break this question down into parts. They question most important is that of the lethal white gene. This is a complicated subject, so bear with us. In Paint horses with Overo patterns (see the seeing spots article with this packet for definitions of the horse patterns) there is a gene defect, now discovered to be a recessive, that causes foal death. The foals are born white with blue eyes or nearly white (with spotted parents) and are either stilborn, or die shortly after birth because a vital part of the colon is incomplete. Researchers have now located the gene in the overo horses. The question has been asked if we have this gene in donkeys. We will say this simple, but the statement is very important. We do not know if we have the lethal white gene because no one has reported any such incidents in donkeys. The only way we will ever know if this fault exists if for people who lose foals at birth to keep records of the foals' color, to have a post-mortem done on the foal, and to record the parent color. A dead foal from two spotted parents - but you have no idea what it died from and therefore no way to help any research team find out if the flaw exists. We know it's embarrasing to have foals die - from whatever cause - but until we - or any researcher - are given some kinds of figures on foal deaths, then no one will ever be able to determine if these deaths are accidental, or due to some genetic factor. We'd love to be able to know if this is a possibility or if we can say it doesn't seem to exist in donkeys, but until we have numbers from breeders, no one will ever know. We have enclosed a form for breeders to keep on file in the event that something like this should ever happen. Please remember it is for the donkeys, and encourage everyone you know to keep records and report incidents. Other health problems? There are genetic health problems, but more are conformation-related than color related. Since we can't say anything about lethal White, the only other real color-related problem is sunburn on pink skin. Blue eyed whites and spotted donkeys with lots of white may get badly sunburned on the pink areas, especially the nose. Sunscreen! Are light hooves (like those on some spotted animals) softer than dark? That's an old debate, and since most miniature donkeys do not wear shoes and work on hard surfaces, probably not as much of an issue as they would be in a work horse or mule. Does white line disease affect one color of hoof more than others - this is probably related more to outside conditions than to the color of the hoof. Is is possible that the aging gray equivilant in donkeys (Frosted) has the same gray-linked disease as in horses, CIDS, or a Combined Immune Deficiency? Again, no records are present. It is possible, but not enougth research has been done. If you are breeding for color, or breeding certain bloodlines and problems start occuring (not just bad bites, which should be elimenated from breeding herds, not just popped stifles, but dead foals or a lot of lost pregancies from certain color combinations) then PLEASE take the time to have DNA samples done, and have a Postmortem done on dead foals! Is black/black points more dominant than black/light points? No, lets rephrase this. The point color (the muzzle, eye rings, belly) is totally separate from the body color. Black body color is recessive whether or not the points are light are dark. Are dark points recessive or dominant? They are recessive to the white points. the white points are dominant, which is why you see them more often. The donkeys with the dark points (termed no light point) have two recessive genes for the dark points. The donkeys with light points can carry one recessive gene for No light points. You get the two recessives together and the surprise black-muzzle foal pops out. Is the demand for certain colors cyclical and/or regional? Regional, we don't show any evidence of. Cyclical, definately. Brown was first, then spots, then black, and now sorrel. 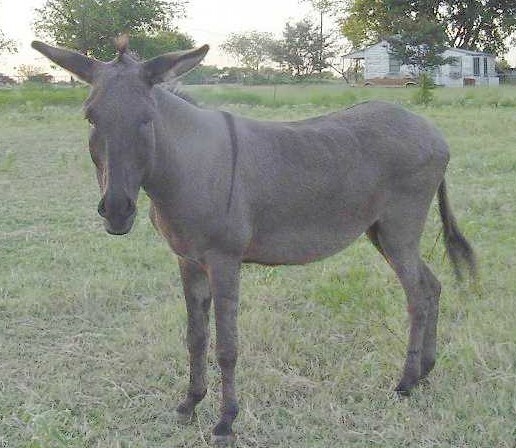 We know that some breeders would eventually like to come up with a true sorrel spotted donkey, but so far, that elusive red-and-white hasn't shown up. The genes for all colors are present in all animals. They may just be the "no" version of the gene, instead of the "yes" version of the gene. This goes for dogs, cats, horses, donkeys and mules. It's best to think of the genes as a series of switches, according to Dr. Phil Sponenberg, one of the leading color genetic researchers, or as the cars on a long train. All of the switches are there, even if in the "off" position, or all of the cars are connected to the train, even if they are empty. In describing colors, at the moment we will do in in the known terms, which are the equine basics. This means using horse color genetic layouts, with variations where we already know that donkey colors differ. While it is easy to say that a horse is a chestnut (ee), what we are really saying is that all of the other colors are "off", so instead of writing out the entire chain each time, we only refer to the ones that are important to the color we are looking at. A chesnut horse is really: ee __ dd gg rr tt oo splspl crcr chch nprl nprl zz ..... and so on. If a researcher looked at this, they would see a horse that carries non-black, agouti status unknown, non-dun, non-grey, non-roan, non-tobiano, non-frame,non-cream, non-champagne, non-pearl, non-silver , etc. If you are building a color equation, you have to stack all of the blocks, or factor in all of the switches or train cars. A black and white spotted donkey isn't just black spotted. (or black, non-brown, no gray, no roan, no dun, non-spotted. Changing any one of these sets of genes will change not only the outward appearance of the animal in most cases, but also how the animal will reproduce. DON'T WORRY IF YOU FIND IT'S COMPLICATED! It is! The genetics you might have learned in high school with red and white pea vines or fruit flies just barely scratched the surface, and the amount of knowledge that has been gained even in the past ten years is staggering! We hope in the very near future that genetic tests for the basic color genes in donkeys will be commercially available. This will help you to tell if your gray-dun jennet can have black or sorrel foals, or if your animal is truly brown instead of black. Please be patient with the research, as it takes time literally looking at every allele or spot on every gene to try and find where the changes occur. Head, Donkey Color Genome Project. Frosted spotted white. The patches that were a contrasting gray-dun at birth have begun to roan (or gray) out. 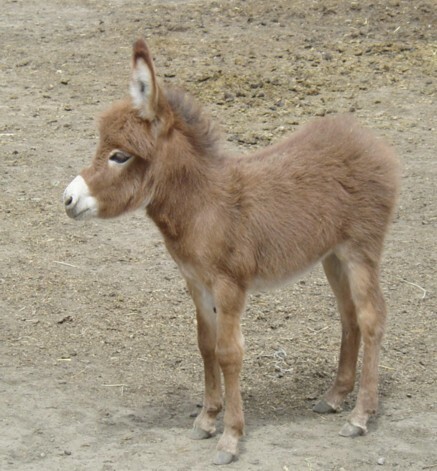 Red (sorrel) miniature donkey foal. The face and legs will gain some degree of roaning as the animal matures. Compare the color with that of a chestnut horse (below). Donkeys look quite flat-brown when put next to sorrel/chestnut horses. While many might term this foal "black" (E_aa) , it is most likely genetically dark brown (E_A_). Some horse people might term it bay, which is closer to the genetics of brown that just black. 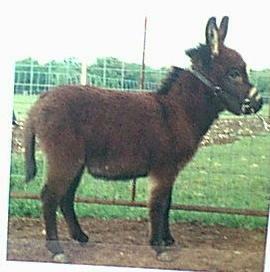 One of our favorite photos of a light red (sorrel) miniature donkey. Sorrel in donkeys is quite different from what is called sorrel in horses. The roaning on the face and legs is also a common feature in a red donkey. Note the variety of shades in these donkeys - gray and white spotted, rose dun foal, and gray-dun/rose dun in the foreground. There is no color in horses that is like rose-dun in horses. Horses that are dun dilutes have yellow tones in their coat. Want to help us on the DNA level of color research? Send in pulled hair samples from your animals! We need hair with at least 10-15 intact root bulbs. Right now we need reds and blacks (no cross). A photo of the animal and their registration number is very useful. NO CHARGE to participate, though your donations to the Genome Project are greatly appreciated.